Randy Jaacks Rustic Woodmen Decks also custom builds Western Red Cedar Screen rooms. By adding a cedar screen room, you will increase the value and charm of your home, regardless of its age. If you have been dreaming of adding an addition to your home, the designers at Randy Jaacks Rustic Woodmen Decks can help with all your needs. From creating the perfect floor plan to creating the addition itself, we will be with you the entire step of the way. Western Red Cedar Screen rooms are a perfect way to be able to enjoy the outdoors while relaxing or entertaining guests. 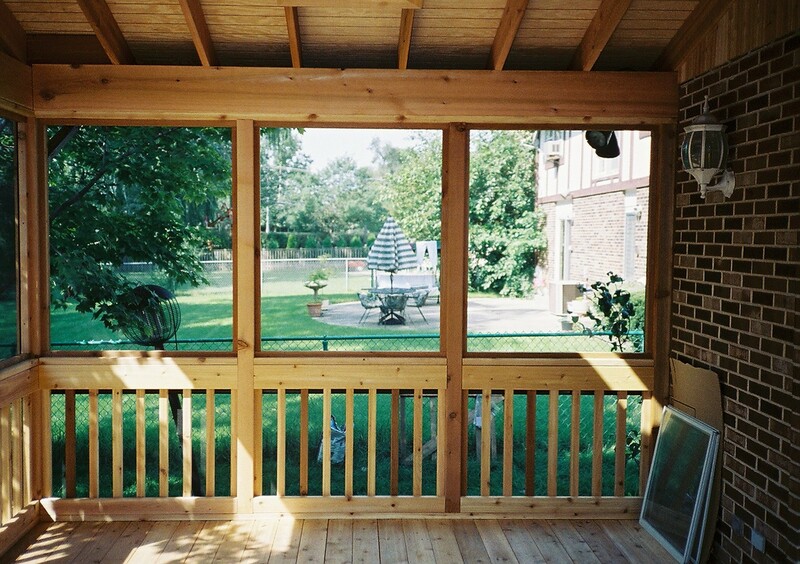 With a screen room, you no longer have to worry about dealing with outside element ruining your porch experience. These screen rooms can be built in many different sizes and attached to the back of your home to give you outdoor living space while being sheltered from the weather and bugs. Our screen rooms come standard with screen windows however; full windows and skylights can also be added. Screen rooms are a great place for people to gather outdoors while staying out of the elements, as well as a great place to relax. Adding a screen room to your home is an excellent way to spend more time outside while adding value to your home.